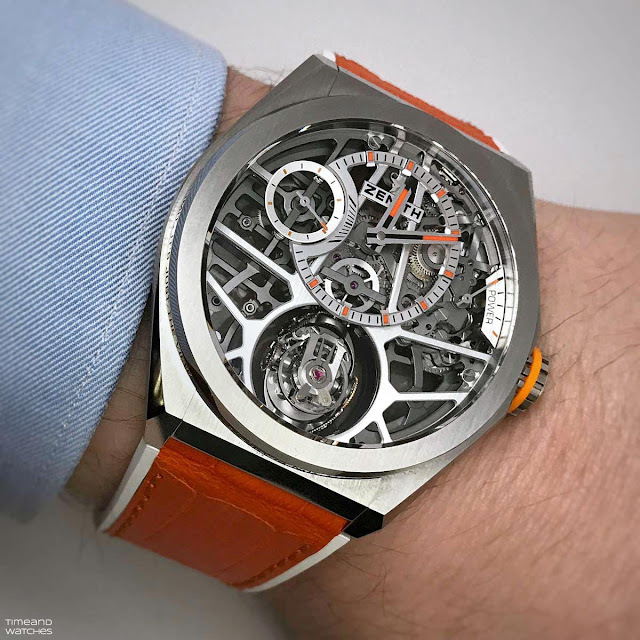 Among several new Defy models, in 2018 Zenith also presented three new colourful and eye-catching limited editions developed in collaboration with musician and watch-lover Swizz Beatz. The first model is the Defy Zero G Swizz Beatz (ref. 95.9001.8812/77.R591), a special 3-piece edition of the Defy Zero G, a watch that is equipped with Zenith’s patented “Gravity Control” module which minimises the effects of gravity on the running rate of the watch by maintaining the regulating organ and the balance wheel in a horizontal position. The hand-wound El Primero 8812 S, beating at 36,000 vibrations per hour and offering a power reserve of 50 hours, is housed in a 44 mm x 14.85 mm brushed titanium case water resistant to 100 metres / 330 feet. 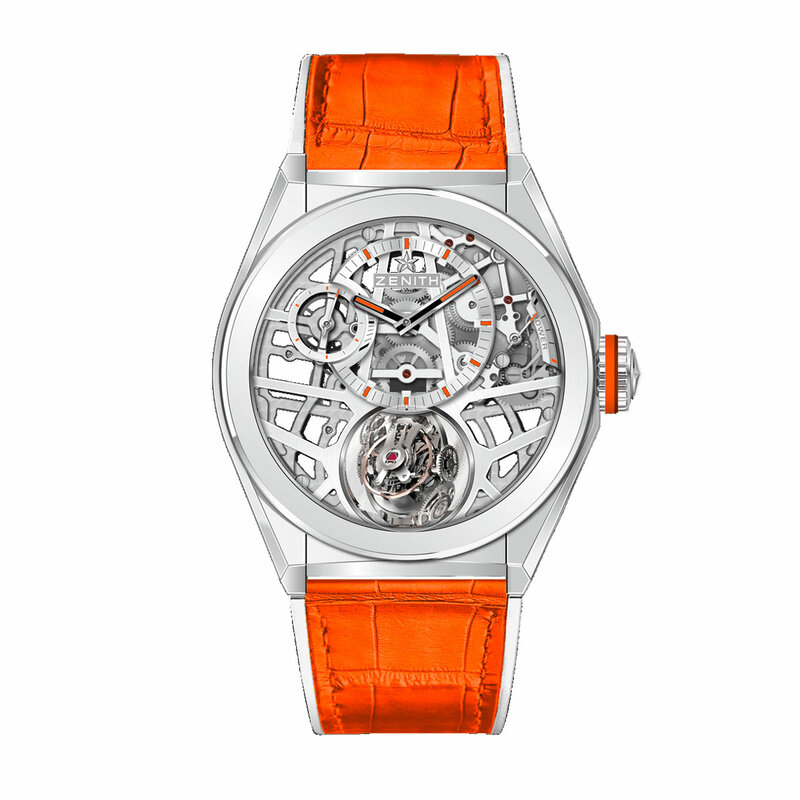 The openworked dial features orange accents on the hands and hour-markers picking up the bright colour featured on the crown ring and the vivid alligator leather coating of the white rubber strap. The bezel is inscribed with a quote from the music artist: “Never let people tell you what you can’t do, because sky’s not the limit, it’s just the view”. The same quote is featured on the two Defy El Primero 21 Swizz Beatz editions: a 25-piece white ceramic interpretation (ref. 49.9003.9004/76.R591) and a 5-unit gem-studded white gold variation fully set with 288 round diamonds and complemented by the baguette-cut diamonds on the bezel (ref. 45.9002.9004/76.R591). Both models are powered by the automatic El Primero 9004 beating at 36,000 vibrations per hour (5 Hz) with a power reserve of 50 hours. That balance wheel is awesome! An eye catcher but not particulraly in love with the case shape..
Zenith Defy El Primero 21 and Defy Zero G Swizz Beatz. Among several new Defy models, in 2018 Zenith also presented three new colourful and eye-catching limiteds editions developed in collaboration with musician and watch-lover Swizz Beatz. 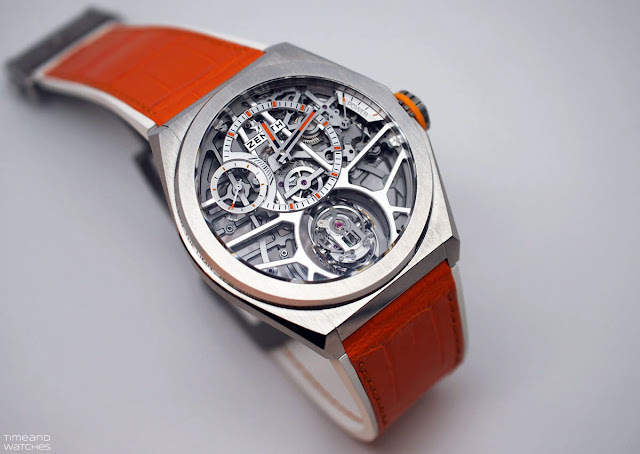 The first model is the Zenith Defy Zero G Swizz Beatz (ref. 95.9001.8812/77.R591), a special 3-piece edition of the Defy Zero G, a watch that is equipped with Zenith’s patented “Gravity Control” module. 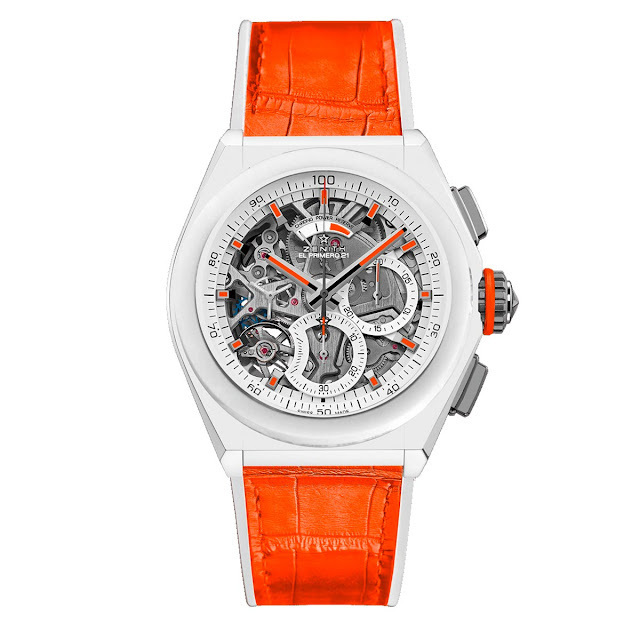 Two Defy El Primero 21 Swizz Beatz editions: a 25-piece white ceramic interpretation (ref. 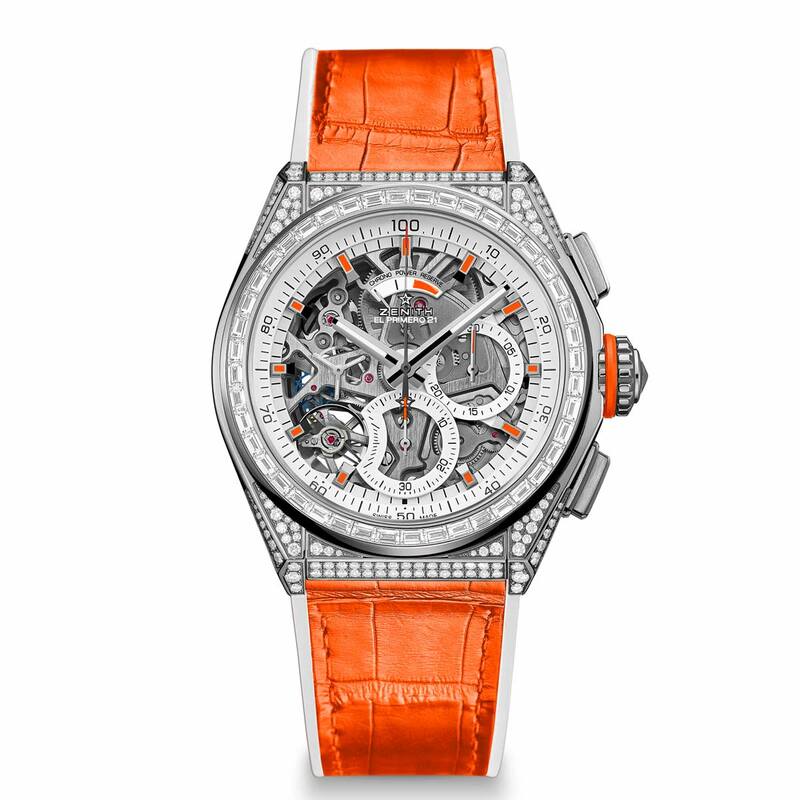 49.9003.9004/76.R591) and a 5-unit gem-studded white gold variation (ref. 45.9002.9004/76.R591).